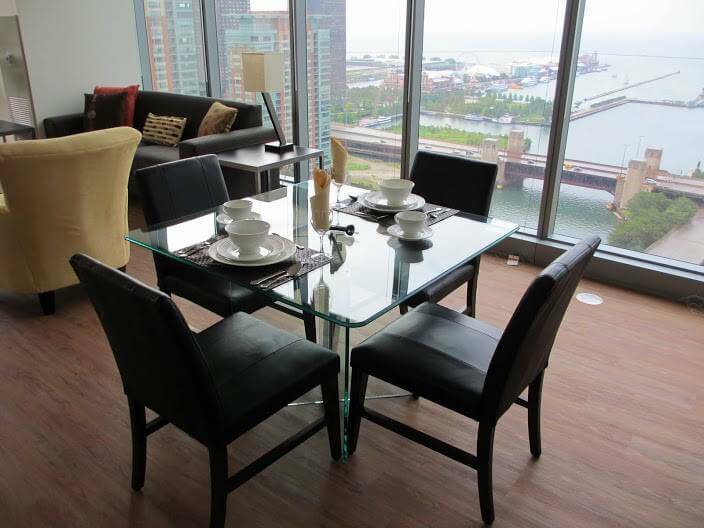 Chicago furnished apartment rentals are available from Premier Luxury Suites. We understand that you may have long-term stay needs or short-term requirements. It does not matter how long you are going to be staying in the gorgeous City of Chicago or within a Chicagoland suburb, we are here to assist you in getting the most upscale living quarters. We offer competitive rates on our city properties and our suburban properties. You can go through this user-friendly website to view the many different kinds of options that we provide here at Premier Luxury Suites. Our Chicago furnished apartment rentals come with plush furniture accommodations. You can also expect some of the best amenities from our company. We offer you weekly maid service (downtown locations), convenient electronics, a fully functioning kitchen, living room, bedroom and dining room. Photos have been put up on this website for your viewing pleasure. Feel free to contact one of our professionals here at Premier Luxury Suites with any questions that you have about our Chicago furnished apartment rentals, condominiums, corporate business suites or rooms for your vacation needs. Premier Luxury Suites always provides you with the best customer service possible. We are here to make your stay within the City of Chicago more enjoyable and comfortable. Special offers attract many customers. Please be sure to ask one of our experts about any current specials that we have available. Most of our offers are in place for a limited time only, so you will want to act quickly if one of our specials applies to you. Don't forget to inquire about our Chicago furnished apartment rentals if you are desiring a beautiful living space within the Chicagoland area. All of our locations are situated close to major roadways and public transportation systems. You also get convenient, close access to cool attractions, such as museums, restaurants and shopping venues. Chicago is an active city with a lot to offer to its residents and visitors. Premier Luxury Suites is always more than ready to accomodate you when it comes to finding the perfect business condo, Chicago furnished apartment rentals or vacation rooms for you and the family. Each of our spacious living spots has their own unique style. You never have to worry about finding a comfortable spot to rest or when enjoying the outside views. Our rooms are picutre perfect and aim to give you a little taste of paradise in every location. Premier Luxury Suites is excited to have the chance to hear from you regarding your rental needs or business room requirements. Our experts will be glad to tell you more about our Chicago furnished apartment rentals and other properties that we have highlighted on this website. We are proud to be a leading corporate housing provider in Chicago. Our company strives to provide you with the ideal living space and most gracious surroundings. Please contact Premier Luxury Suites today to find out more about our Chicago furnished apartment rentals and how we can assist you!